Battlefront has a feature article up looking at the M113 Passengers and Crew box set for Tour of Duty. 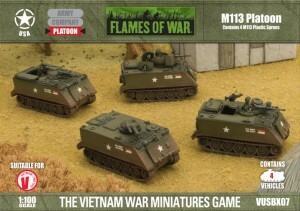 M113 Passengers & Crew (VUS710) includes ten Seated Passenger figures, four Mortar Crew figures, four M60 Gunner figures & four Vehicle Commander figures. Extensively used in Vietnam, the M113 proved to be a solid workhorse capable of breaking through heavy jungle and transporting infantry through to enemy positions.